Thomas Sensei began training with Doug Meagher at Northwest Goju Ryu Karate early 2010 when she was sent to receive upgrading. Since that time Thomas Sensei has been released on transfer to Northwest Karate to become a permanent member/student. She is a valued student and instructor , bringing new ideas and ways of teaching. We look forward to having Melissa’s brand of teaching for many years to come. Mr. Winsborrow has been training with Northwest Goju Ryu Karate since 1998 . As a father and Grandfather Kevin brings a special way of teaching children that only a Grandfather can. Mr Winsborrow also holds a Brown Belt in Judo, so it is very helpful to have him teach proper ways to fall . We look forward to having Sempai Winsborrows leadership with Northwest for many years to come. Mr. Bale joined Northwest Goju Ryu after a layoff from Karate of nearly 2yrs. After counciltation with Sempai Bale 2012 , he decided to become a member of Northwest Goju Ryu. Since joining Northwest Bryans understanding of his karate has jumped in leaps and bounds. His soft manner of teaching puts people at ease allowing for a better relaxed learning process. We look forward to having Bale Sempai work along side us for years to come. Alison called to join Northwest Goju Ryu after a 12yr absence from Karate. She had previously trained in Okinawan Goju Ryu and decided that through many searches of the internet to find a matching school, Northwest was the only natural fit for her. Since that time Alison has trained 5 days per week ,,every week in order to maximize her education. We are pleased to have Alison an assistant during classes and expect to see great things from this hard working student. Meagher Shihan hold a Godan (5th Degree Black Belt ) in Goju Ryu Seiwa Kai Karate (Japan). 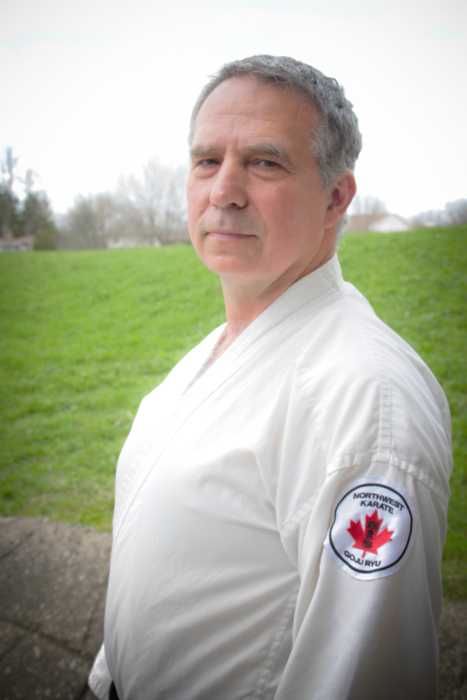 Meagher also holds Black Belt Ranks with Karate Canada (Sports Canada) Dragon Society (pressure points)Doug opened his first Dojo in 1992 after years of teaching at other school. Meagher Sensei felt it was time to take on his own students rather than teach students of other Sensei. And now after many years he is proud to say that Northwest Karate although small in numbers , continues to show quality of teaching through each and every student at the school.